There's something to be said about a well cast first sentence on page one of a novel - This is what I remember about that night - my last night alive. Was the main character, 78 year old Essie Mae already dead then and telling her story from the grave? Why did she die? Who was she? I wondered all these things like a fish wonders what that worm dancing in the riffles would taste like. I was hooked. By that first sentence and the warm tones of that cover. 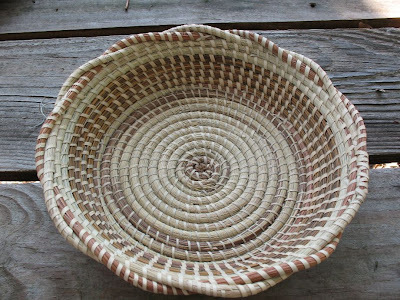 Essie Mae Jenkins is a sweetgrass basket maker who sells her finished products from a roadside stand on a tiny anonymous highway along the coastal islands of South Carolina. From there she sews her baskets, weaving in some of the sweetgrass and Gullah culture, and a little voodoo magic for good measure, all in the presence of her dead husband, Daddy Jim. 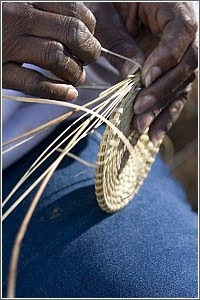 Like the vanishing sandy beach ecosystems that sustain that billowing native grass, so is the talent of making these unique baskets. Essie Mae wants to pass it on like it was passed on to her. But nature's forces are working against her, not unlike the forces of prosperity are working against the disappearing sweetgrass. Like all of us as we age, Essie Mae feels like she's slowly disappearing from the landscape as well. 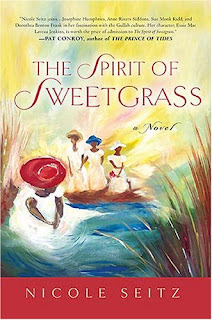 Well-written in great Southern voice, The Spirit of Sweetgrass hits on many levels. It brings into sharp focus the fears that we all worry about as we age - of being forgotten and replaced. I wondered what I would leave behind for my family, suddenly wanting to take up a new skill or perfect the two or three that I have! And, I thought of what's been left for me in previous generations and I became both happy and melancholy at the same time. Memories, love, cherished mementos, and most importantly a knowledge of things particular to my family and friends always bring in torrents of emotion. We all wish for this, in any culture and time. I enjoyed reading about other lifestyles and customs unfamiliar with my own. Now, if I could just get my hands on one of those baskets! I do love that cover. Very inviting! I'm glad that the book seemed enjoyable as well. I also love it when a book catches you from the very first sentence. This story sounds lovely. I need to look out for it! Thanks for your review! Did you know that you can create short links with Shortest and make dollars from every visitor to your short urls.